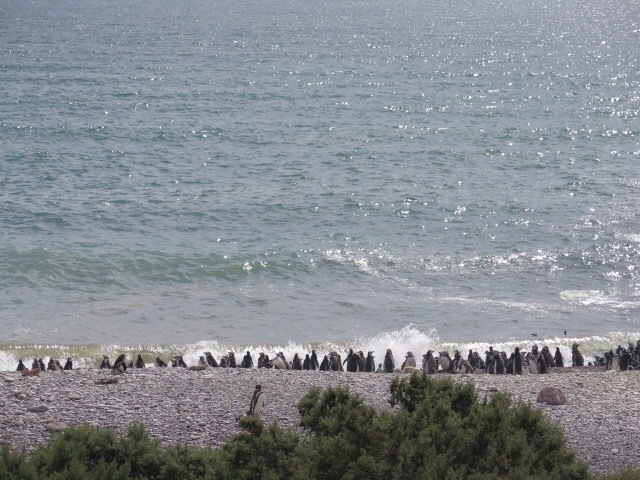 More Penguins! | So Many Exciting and Beautiful Places! Today was a sea day, so there isn’t much to report, except I played my very first game of Shuffleboard today. Yes, I know that’s an old people’s game, but, face it, I’m getting older every day. I was pretty pathetic at first, until one of my teammates gave me some pointers. I did get better, but still was the worst member of the team, although I did manage to score 7 of the necessary points to win. And my team won! Four couples, men vs women (they thought it would be a shoo-in for them,) and we wiped up the floor (or the board) with them. I might just be willing to play this game again. 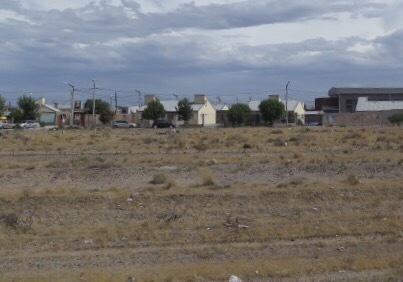 We arrived in Puerto Madryn, Argentina early this morning, and got up really, really early this morning to get on a bus for a 2.5 hour ride to Punta Tombo, a peninsula about 130 miles south of the city. It was totally worth it. This part of Argentina is desert, receiving less than a foot of rain per year. It’s somewhat flat, but not completely – the terrain is defined as steppes or plateaus. There is no fresh groundwater here – all of it must be brought in. The only trees we saw were planted. The only things that grow naturally are scrub brush and grass. Homes in the city have freshwater cisterns on the roofs. As you get farther from the city, there is no electricity either. The farmers use windmills to generate power. We didn’t see any crops, but did see sheep. 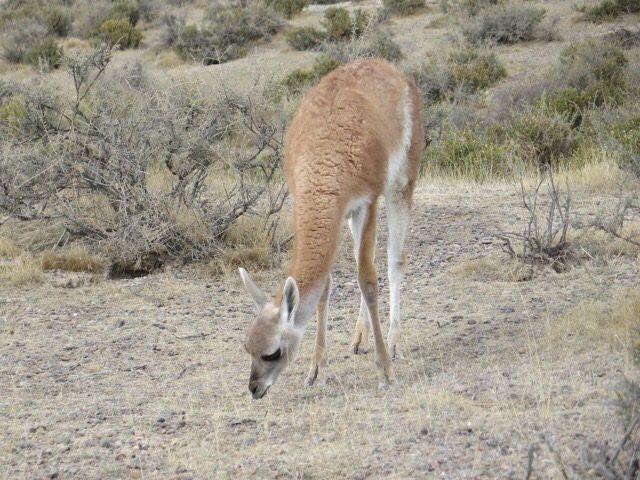 There are also reas (similar to the emu) and guanacos (small camels) that share the land with the sheep. Argentinosaurus, the largest known dinosaur to walk the earth, was discovered in this region in 2014. It’s estimated to have been about 110 feet long, and to have weighed about 70 tons. 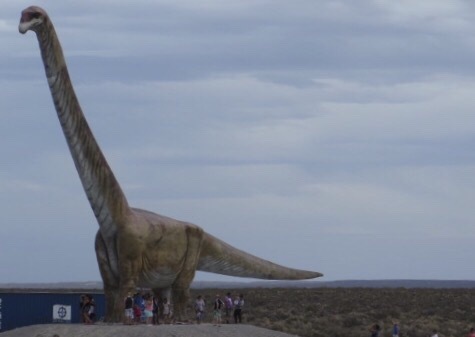 The Argentines are understandably proud of this find, and they recently (just last week) installed a life-size statue along the highway. This area was settled by Welsh immigrants between 1865 and 1914. 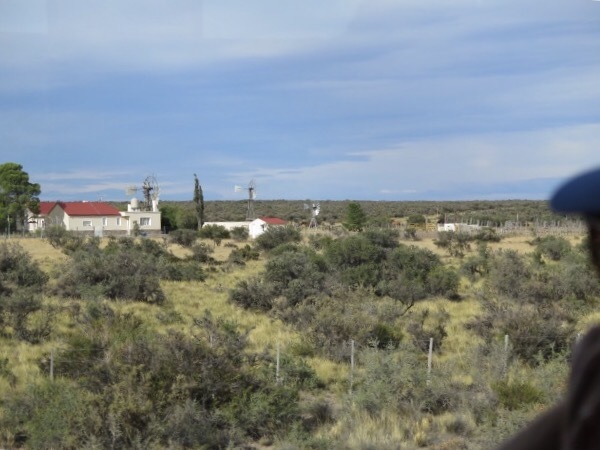 Each received 247 acres of land from the Argentine government in return for farming the land. Many of these settlers had been miners in Wales, but they learned how to farm and many became successful sheep ranchers. 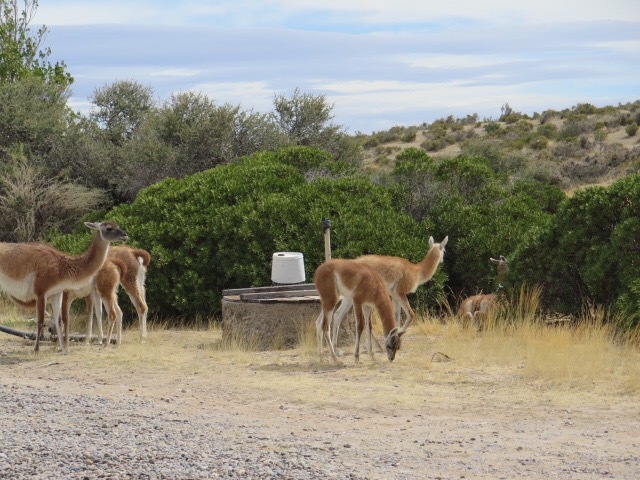 One of those successful ranching families donated about .8 square mile of land to the government, and that land now comprises the Punta Tombo Nature Preserve. 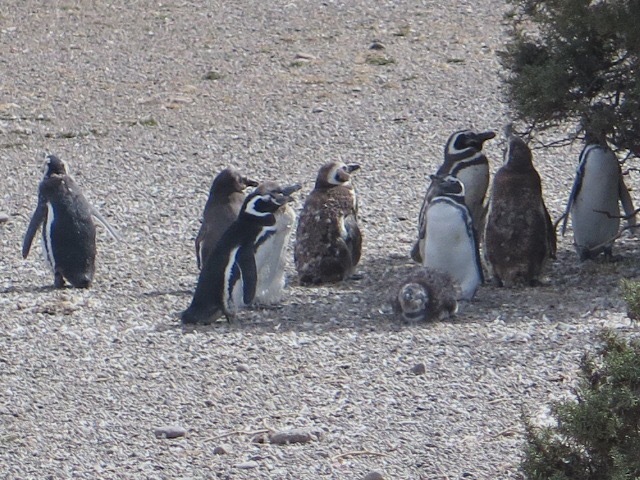 Punta Tombo is home to 210,000 pairs of breeding Magellanic penguins. 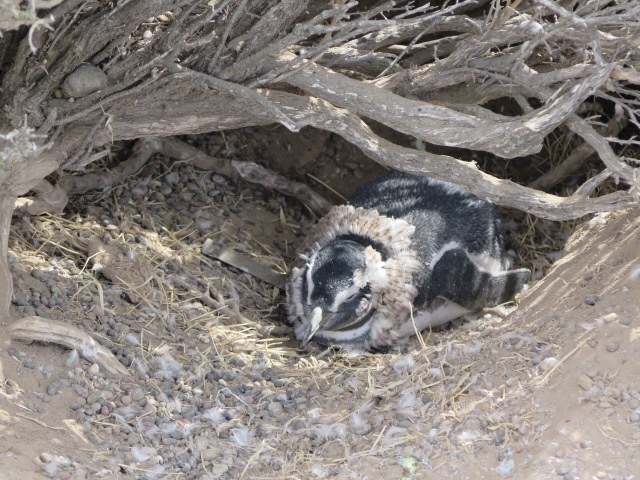 These penguins burrow holes in the ground, often under shrubs, for their nests. 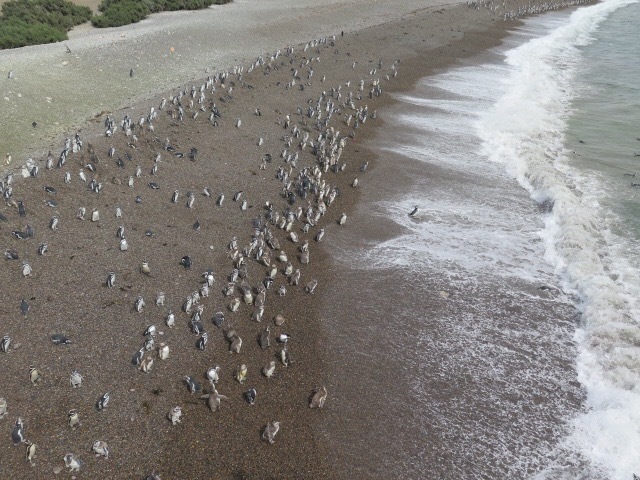 They winter in the waters near Brazil, and swim 3,700 miles to Punta Tombo every year to lay their eggs. Each nesting pair lays two eggs, which, if all goes well, will hatch in November. The incubation period is 40 – 42 days, and both parents share the task. The chicks grow very quickly, they need to be independent within 2 – 2.5 months. At the end of summer, they return to Brazil. The juveniles are grey and white, while the adults are black and white. It’s believed that the Magellanic penguins may live for 30 -35 years. 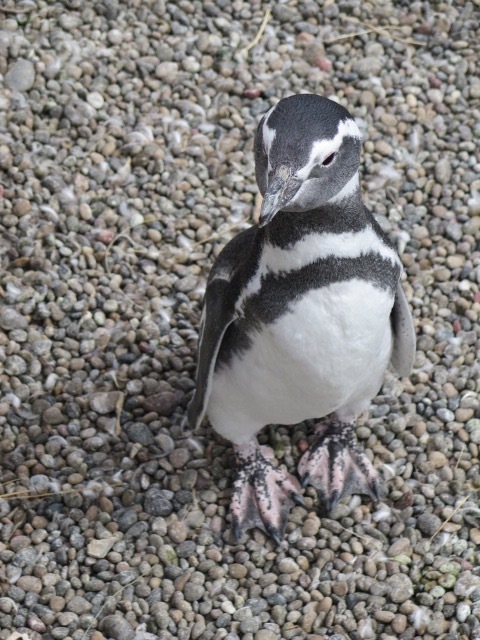 We were treated immediately upon entry to the park by the sight of a darling penguin walking toward us on the boardwalk, as if coming to welcome us. We made way for it to get to wherever it was going. 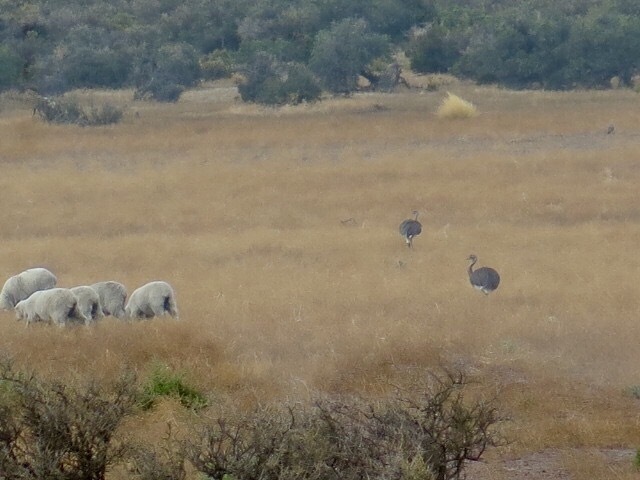 The Magellanic are much smaller than the King and Gentoos that we saw earlier on this trip. These ones barely come up to my knee. They move about freely in the preserve, so we were treated to many “up close and personal” views. It was simply delightful. Many of the juveniles were molting – down everywhere. 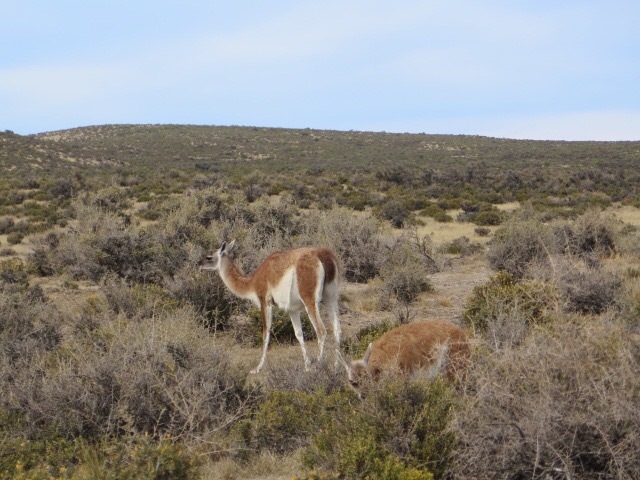 There were several groups of guanaco in the park as well, again, not far away at all. We returned to the ship after a long day, only to experience another delight. 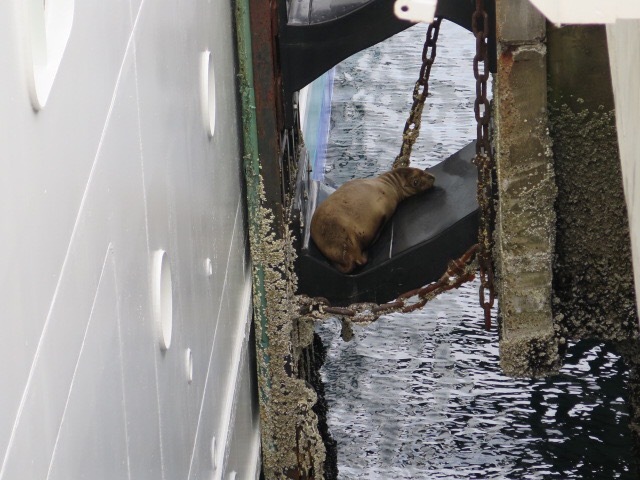 As we were boarding, we saw a sea lion resting on one of the ship’s fenders, between the ship and the dock. 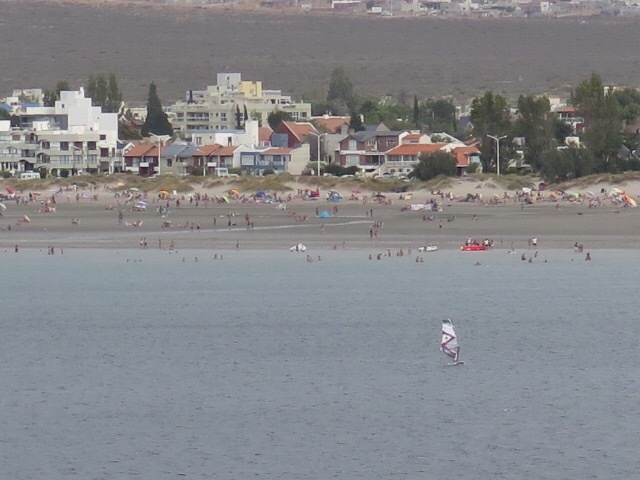 This was the end of a four-day weekend, and we saw lots of people enjoying the beaches in Puerto Madryn, or sailing or kayaking in the sea. This entry was posted in Argentina, Crystal Cruises, Penguins, South America Travel and tagged Dinosaurs. Bookmark the permalink.